A return to the Deutschmark or a core monetary union would impoverish Europe’s economies. Instead, Eurobonds could offer a viable solution to preserve unity in diversity. An overstretched EU-level monetary policy and differences in real interest rates within the Eurozone have led to a vicious circle of asset bubbles in some Eurozone countries and slow growth in others. The introduction of Eurobonds, together with fiscal innovation at the member state level, can help to ensure income convergence with stability, argue Anke Hassel and Waltraud Schelkle. An influential interpretation of the European sovereign debt crisis suggests that a uniform monetary policy for a heterogeneous group of countries is at the heart of the Eurozone’s current problems. Supposedly, the only solution is to create a smaller Eurozone, made up of countries of similar economic structure and fiscal strength. The remaining nations should return to their single-nation currency – at least temporarily. Otherwise the existing conflicts could escalate, eventually leading to the end not only of the Euro but also of the EU. Eurobonds with a uniform interest rate would create an insurance pool of and for all Euro countries. They would protect single members against the tendency of financial investors to take flight from national bonds because of low growth rates that raise doubts about the ability to service debt. Ireland experienced exactly that in summer 2010 when its widely praised austerity programme, launched one year earlier, produced negative growth rates – as anybody with intermediate macroeconomics would have expected. Rising interest rates then depress growth even further and jeopardize the solvency of any sovereign debtor. Eurobonds would have kept interest rates down and facilitated the country’s recovery. They would have made use of the diversity of each Eurozone country enabling them to trade and prosper. Low real interest rates provide an opportunity to accelerate catch-up growth. This is exactly what prevailed before the crisis. Low interest rates mean lower barriers for investment and the consumption of durable goods, like housing and cars. It was more pronounced in lower income countries that experienced high growth and higher inflation rates because of the resulting bottlenecks and high capital inflows. This process of catching-up may be undermined by the side effects of negative real interest rates, namely rising private debt and asset bubbles. When financial investors then take fright, real interest rates go through the roof, as shown in Figure 1, and send a country into a downward spiral. A single interest rate policy is overstretched when it comes to reining in regional credit market bubbles, but financial market regulation can help. This is exactly what the Basel Committee has now introduced with the macroprudential instrument of counter-cyclical capital buffers. Fiscal innovations would also be helpful, for instance a temporary windfall tax on housing transactions when mortgage markets are completely out of line with long-term ratios of housing prices and earnings. There is no question that instruments still have to be developed. But to stipulate that, in order to achieve this, monetary union has to be cut down to the size of a core union is analogous to asking for the suppression of all booms until we know how to eliminate all inflationary pressures – not even the most conservative Bundesbanker would take that position. Given that we are where we are, it seems to be more sensible to catch the bull by its horns and consider the Euro area as if it were already one economic space. German unification also meant forcing two different economic regions into one monetary union and a uniform interest rate policy had to be applied. This was socially acceptable only because the so-called Solidarity Surcharge allowed for considerable redistribution from West to East combined with a wave of outmigration by young East Germans to the West. Berlin is permanently on the verge of bankruptcy and its consolidation of its own resources is no less utopian than that of Greece, yet nobody would suggest ejecting the region from the Euro area. The arsenal of instruments used in German unification may have to be scrutinized for the solution to the Euro crisis. Promoting mobility has to be part of the solution, as it has been in the remarkable convergence of Central and Eastern Europe. And, in saying this, it must be reiterated that nobody has to be put into a straitjacket of ‘Europeanness’. What is more, even the most demanding calls for solidarity pale in insignificance compared to the pain that a break-up of the Euro area would cause everyone. We all know that replicating German unification in the solution of the Euro area crisis is not straightforward. The Euro area does not have a European federal government, which can use social security or a fiscal transfer mechanism to reduce the inequality of living standards between members. The EU budget amounts to a bit more than one percent of the union’s GDP. The solidarity of Germans or the Dutch with Greeks (or the Irish or Italians) is limited – as is that of the Northern Italians with the Southern Italians, let’s not forget. A European federal government, which is the precondition for joint liability of member states in the Euro area, is inconceivable at this stage, for lack of competences and political legitimacy that only a European demos and a truly European parliament can bestow on political authority. Even migration is hampered by existing language barriers. So what can be done? Germany responded to the relatively high real interest rates that the introduction of the Euro entailed with a long-term strategy of wage moderation. Such a strategy relies on demand stimuli from the international, not least the European, economy. Germany’s regained economic strength is important for the Euro area’s reputation as a viable and competitive economic project and must not be put at risk light-heartedly. However, this strength must also not undermine the economic viability of the periphery and thus reinforce inequalities. The issue of a Eurobond would create positive incentives to stick to rules that are meant to ensure the stability of the monetary union. Without such an insurance mechanism national authorities are exposed to the fairly arbitrary actions of investors and high and volatile costs of debt service. The annual volume of Eurobonds would have to be determined in light of the cyclical position of the Euro area as a whole, with a view to matching the monetary stance of the ECB. The share of each member state in the annual Eurobond issue would take account of the country-specific cyclical position. Liability would have to be shared, i.e. everyone assumes responsibility for the bond issue as a whole and individually for their own specific share. With such an institutional arrangement of joint public debt management in place, the difference between countries in terms of their cyclical characteristics and patterns would actually turn into an advantage for macroeconomic policy. To the extent that members are at different stages of the business cycle, the aggregate cycle becomes smoother and stabilisation of the Euro area would not have to engage in heavy-handed counter-cyclical interventions. The ECB for its part can and must define its own criteria for Eurobonds that it accepts at the discount window, in normal as well as in crisis times. One cannot prohibit private market actors from asking credit rating agencies to rate Eurobonds. But it is outright scandalous that the ECB makes itself dependent on the verdict of speculators as to whether a country is creditworthy or not. This makes the ECB’s stabilisation policy rely on exactly those pro-cyclical market forces that a monetary authority is meant to counter-act. Defining these criteria would also put an instrument of fine-tuning at the ECB’s disposal. For instance, the ECB could tighten or loosen these criteria depending on whether the overall annual issue of Eurobonds has proven to be too high or too low, respectively. This kind of fine-tuning of the effects of public debt issues is perfectly compatible with the explicit or implicit mandate of an independent central bank, namely to ensure stability of the financial system. The operations of Eurobonds are bound to lead to some disputes between monetary and fiscal authorities. But the easy times for central banks are over anyhow; the men in grey suits from the ECB can no longer one-sidedly comment on budgetary policies, while being terribly sensitive to even the slightest doubts expressed about their actions. After all, the dire state of the European banking system makes the monetary authorities as dependent on the goodwill from governments as the latter are dependent on the cooperation from the ECB when the bond markets, rightly or wrongly, play up. This does not have to be to the detriment of the quality of economic policy. A joint issue of Eurobonds would give incentives to both sides to enter into continuous and timely consultations. This brings us finally back to the question of a core monetary union. There is no such thing as a political and legal exit option from the Euro area. There is no such provision in the European treaties. This is not simply an oversight; it makes perfect sense. This is not only because an exit for a country like Greece would amount to a veritable breakdown of its economy; compared to this scenario, the harsh conditions that austerity creates at the moment would appear to be a gentle adjustment. For the rest of the Euro area, the exit of a member would become a permanent source of instability, both for each exit candidate and the EU as a whole. 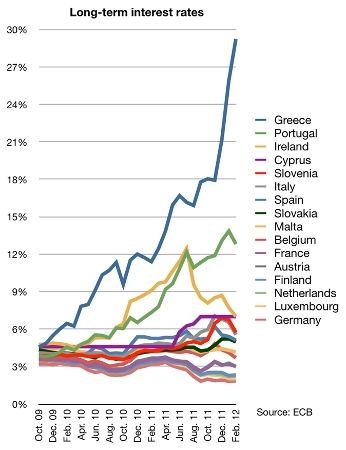 If Greece with its roughly three percent share in the GDP of the Euro area cannot be supported, how can it be made credible that Spain or Italy can stay in? And who would want to guarantee that France can always exercise the supposedly necessary restraint of wages and public deficits? Whenever doubts arise, the Euro area would be exposed to the speculation of who will be forced out of the Euro area. The already fragile solidarity among European member states would become highly conditional, every further move towards integration appearing a frightful liability rather than a useful pooling of resources. Sooner or later, anti-European sentiments would arise and turn against ‘Brussels’, questioning its political legitimacy. In this regard, Angela Merkel is right for once: If the Euro fails, the European Union fails. History is a one-way street. A longer version of this article first appeared in the Policy Network paper The Future of Economic Governance in the EU. Anke Hassel is Professor of Public Policy at the Hertie School of Governance in Berlin. Previously, Hassel taught at the International University in Bremen and was a senior researcher at the Max-Planck-Institute for the Study of Societies in Cologne. She is a columnist for the political journal Berliner Republik on German politics. She is particularly interested in varieties of capitalism, the role of labour, labour market policies and trade unions. Waltraud Schelkle is a Senior Lecturer in Political Economy at the European Institute of the London School of Economics. Furthermore, she is an Adjunct Professor of Economics at the Economics Department of the Free University of Berlin. Previously, Schelkle worked as a development economist at the prestigious German Institute of Development in Berlin. She is particularly interested in the political economy of European integration.